For over 30 years, Acucraft has perfected the double-sided wood burning fireplace concept. It began 3 decades ago when a couple came to Acucraft seeking the beauty of a traditional wood burning flame in more than one room in their home. Acucraft’s double sided wood burning fireplaces combine ingenuity with fine craftsmanship to give you the ultimate fireplace experience in more spaces than one. With many different styles, sizes, and designs, you can have the wood burning fireplace that suits you and your desires. What Makes Acucraft’s Double Sided Wood Fireplace Design Superior? Acucraft wood fireplaces offer “whole home heating.” Operating one of Acucraft’s high-tech double-sided wood burning fireplace models allows the unit to heat up to 3,000 square feet! Not only will this bring a cozy ambiance to your space, it will also save you money on your heating bills. Our wood fireplaces can be created to match any style. Whether you search for a more rustic feel or prefer a modern approach. Acucraft will craft a fireplace that reflects your personality and creativity. Arched or rectangular doors are available in many different finishes including: patina, clavos, hammered, and more. And with double-sided wood fireplaces, the same style will be brought to two spaces with one fireplace. Traditionally, Acucraft’s wood burning fireplace come in three desirable sizes: 36” wide, 44” wide, and 48” wide. The sizes allow for the best combination of burn time and viewing areas. However, if you are looking for something incredibly dramatic, Acucraft can custom create a 2-sided fireplace to any size you’d like! A majority of the 2-sided, prefab fireplaces on the market are exclusive to gas fireplaces. But a double-sided wood burning fireplace is different. Not only do you get two views in one space, you can also make your double-sided fireplace an indoor/outdoor fireplace! This allows you to store your wood outside so you would not need to bring the wood indoors. And with our fire screen option you can operate the fireplace without doors, creating a fire pit effect. Acucraft wood burning fireplaces are also unique in the different options that we offer. For instance, you can add on the option of a water loop for your wood fireplace. 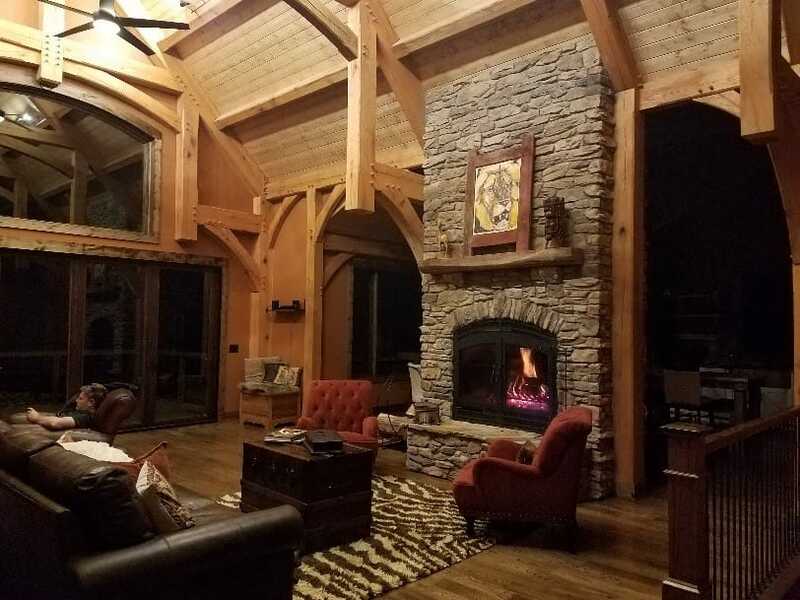 The water in the water loop is heated by your fireplace and is then used for energy efficient in-floor heating or as a supplemental water heater! There are other options such as our BBQ grill, fire screen, and more! Wood burning fireplaces have many advantages. They add a gorgeous ambiance, can lower your heating bills, and provide additional style and flash to your space. And with an Acucraft double sided wood burning fireplace, you get all of the advantages times two! Learn more about our wood burning fireplaces today!